The visitors looked in control when Divock Origi went past Artur Boruc and curled home their second from a narrow angle. Bournemouth brought on Ryan Fraser in the 55th minute and that proved to be the turning point of the game. Seconds later James Milner brought him down in the area and Callum Wilson scored the penalty. 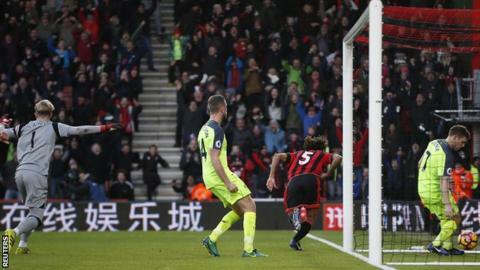 72 mins: Liverpool are inches away from going 4-1 up, as Boruc holds Milner's corner, but almost takes it back past his line. Goal-line technology shows it was millimetres from being 100% across the line. Before the game, Football Association panel member Howard Wilkinson told BBC Radio 5 live's Sportsweek that Bournemouth boss Eddie Howe had been considered for the England job. Results like this will do nothing to harm his chances when newly appointed Gareth Southgate eventually goes, although that is if Howe is not too successful for international management next time it comes around. Having said that, he could not have imagined his introduction of Fraser, an uncapped 22-year-old Scottish winger, early in the second half could have worked out so well. The Cherries could have been forgiven for crumbling when they went 2-0, and especially 3-1, down. History was not on their side. In all previous nine games against the Reds, stretching back to 1927, they had drawn two - in the FA Cup in 1927 and 1968 - and lost the other seven, including the replays to those games. But they never gave up, and move into the top half of the table with these three points. The Cherries recovered a two-goal deficit to win a Premier League match for the first time. The last two occasions of a losing side being two goals ahead at half-time in a Premier League match now involve Liverpool losing to a South Coast club (also 2-3 v Southampton in March 2016). Only two players have scored more goals in their opening 13 Premier League games for Liverpool than Mane (7) - Robbie Fowler (8) and Daniel Sturridge (10). The Reds have netted 19 first-half Premier League goals this season, three more than any other side. Callum Wilson has scored in five of his nine Premier League starts at the Vitality Stadium for Bournemouth (five goals). This was the fourth time under Klopp that Liverpool have been two goals ahead in a Premier League game and failed to win (2-2 v Sunderland, 2-3 v Southampton and 2-2 v Newcastle). Ryan Fraser is just the third Premier League player this season to score and assist in a game as a substitute (Shaun Maloney and Robert Snodgrass for Hull are the others). Under Klopp, Liverpool have kept just four clean sheets in 23 away Premier League games, conceding 38 goals. Liverpool lost a Premier League match 4-3 for the first time since November 2000 against Leeds United. Bournemouth boss Eddie Howe: "It was a great game, obviously from our perspective because we won. Liverpool were excellent in the first half and we knew their quality. It took our substitutes to make an impact and liven us up. Ryan Fraser deserved that opportunity today. "It would have been easy for our players to give up and see out time, but our group knows not to give up. We scored at the right time, and the easy thing when you equalise is to sit back and defend that but thankfully the lads kept going. "In the second half we looked like scoring every time we attacked. For this club and everyone involved, it's made for a very special day. These days are huge for us. We'd never been in the Premier League until last season so we're making history for the club." Bournemouth are away to Burnley, whom Howe managed in between his two Cherries reigns, on Saturday (15:00 GMT) in the Premier League. Liverpool host struggling West Ham the next day (16:30 GMT). Match ends, Bournemouth 4, Liverpool 3. Second Half ends, Bournemouth 4, Liverpool 3. (Bournemouth) wins a free kick in the defensive half. Goal! Bournemouth 4, Liverpool 3. Nathan Aké (Bournemouth) left footed shot from very close range to the centre of the goal. Attempt saved. Nathan Aké (Bournemouth) right footed shot from the centre of the box is saved in the centre of the goal. Attempt saved. Steve Cook (Bournemouth) right footed shot from outside the box is saved in the centre of the goal. Assisted by Jordon Ibe. Attempt missed. Adam Lallana (Liverpool) left footed shot from outside the box is high and wide to the left. Assisted by Divock Origi. Attempt missed. Divock Origi (Liverpool) right footed shot from the centre of the box is just a bit too high. Assisted by Dejan Lovren with a headed pass following a corner. Corner, Liverpool. Conceded by Nathan Aké. Offside, Bournemouth. Harry Arter tries a through ball, but Benik Afobe is caught offside. Corner, Bournemouth. Conceded by Jordan Henderson. Benik Afobe (Bournemouth) wins a free kick in the defensive half. Attempt blocked. James Milner (Liverpool) header from the left side of the box is blocked. Assisted by Jordan Henderson with a cross. Attempt missed. Jack Wilshere (Bournemouth) left footed shot from outside the box is high and wide to the left following a corner. Corner, Bournemouth. Conceded by Loris Karius. Attempt saved. Benik Afobe (Bournemouth) left footed shot from the centre of the box is saved in the bottom left corner. Goal! Bournemouth 3, Liverpool 3. Steve Cook (Bournemouth) right footed shot from the centre of the box to the bottom left corner. Assisted by Ryan Fraser with a cross following a set piece situation. Goal! Bournemouth 2, Liverpool 3. Ryan Fraser (Bournemouth) right footed shot from the centre of the box to the bottom right corner. Assisted by Benik Afobe. Attempt blocked. Benik Afobe (Bournemouth) right footed shot from the centre of the box is blocked. Substitution, Bournemouth. Benik Afobe replaces Dan Gosling. Corner, Liverpool. Conceded by Ryan Fraser. Attempt saved. Ryan Fraser (Bournemouth) left footed shot from the centre of the box is saved in the top centre of the goal. Assisted by Callum Wilson. Substitution, Liverpool. Adam Lallana replaces Sadio Mané because of an injury. Attempt missed. Harry Arter (Bournemouth) left footed shot from outside the box is high and wide to the left following a set piece situation.